If you read Zizek, you know this bit as well as you know the wheelbarrow joke. Here’s evidence of our pathetic attempt to elude the traumatic kernel of the Real. We need to know that the pleasure will always come with filth; that the neighbor will never not be in some way annoying; that dreams of purity, happiness, and unmediated delight are sick frauds, liberal dreams just this side of fascism. 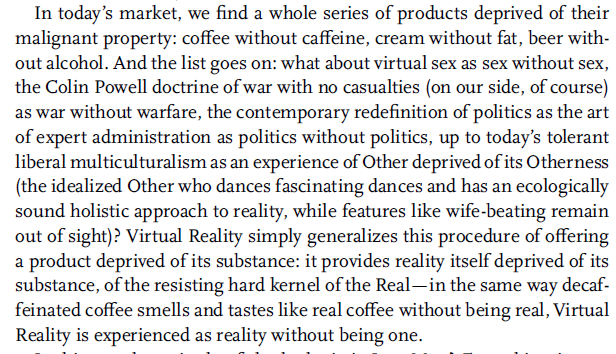 For Zizek, maybe, the worst of these fantasies is the fantasy of capitalism without excess. The Nazis wanted just that, blaming the Jews for the structural unpleasantness of business. The fascist, eschatological dream is the dream of a culture without disharmony, a state without excess, money without suffering, life without rot. It’s an attractive argument, if Zizek’s celebrity is any guide, and attractive because it’s so very portable. We on the left like it because it’s an argument against fantasies of wholeness. If the Real always sticks to our shoe, then there’s no way to get that pure, happy small town world that, say, “The Christmas Shoes” loves. There’s no chance at kitsch. But it’s also just this side of “you have to break eggs to make an omelette” authenticity of gritty realism. Gritty realism is a wonderful antidote for people — men especially, comfortable men especially especially — who feel that they’re leading too soft a life. That dream of coming into contact with the harsh truth of things, and living through it, is the core of most “Last Man” fantasies (from End of Grass to The Road to The Dog Stars); but it’s also the core of living in this capitalist world and constantly going on about a grimness that the comfortable man himself perpetuates. The gritty realist believes himself to be living without illusions, bedding down with the Real, facing things “as they really are.” The gritty realist indulges in guilt for the sake of honesty and in honesty for the sake of itself. There’s no goal, no hope or plan of change, because that hope is, of course, false. Gritty realism is knowing something as true and, because it’s true, just continuing to live with it, so that perpetuating the status quo becomes a virtue. They’re the ones who don’t walk away from Omelas. So, let’s take the ending of Snowpiercer, which, you know, spoilers. Wilford plays the standard world-weary sophisticate who functions as the villain and object of desire in so many contemporary actioners (see also Loki or, uh, Paradise Lost), there to offer Real Power, but only if its recipient acknowledges the traumatic kernel of the Real. In fact, he’s selling gritty realism to the gritty Real itself (Curtis, played by Chris(t) Evans), the baby-eating filth from the back of the car, there to stain the smooth workings of the machine; but Wilford out-reals the Real by telling Curtis why he needs children to keep the machine running: without this continual sacrifice of children, there’s no future for humanity. We have to keep bringing them forward and using them up. It’s gritty Reproductive futurity, the dialectical reversal of the tyrannical child, so that they become slaves to our own stupid desire to survive. Curtis says no. He sacrifices his arm, and then his whole self, colluding in the (accidental?) destruction of the train, leaving only Yona (Go Ah-sung) and Timmy (Marcanthonee Reis) alive, there, in the mountains, in a world that’s gradually thawing, probably on the verge of either starving or being eaten, either by each other or the polar bear (see also this crap post). The choice seems to be to go along with the train or to walk away into nothing, because anything else would try to elude the traumatic kernel of the Real. But that hopeless grittiness forgets that this isn’t a closed system (EDIT: contra Aaron Bady’s excellent and as they say epic post at The New Inquiry, which I just read, where he writes “This movie takes for granted that there is no alternative, and that’s the thing we shouldn’t take seriously”). Namgoong Minsu (Song Kang-ho) knows that the earth is gradually rewarming. Maybe it’s not: the ‘frozen arm’ punishment early in the film shouldn’t have worked in a warming world. Yona and Timmy and everyone might have walked away from the train; they might have hoped on the sun and the earth’s own molten core; they might have seized control of the train, redistributed the goods and the labor, ate the resisters, and remembered that they are human, capable of making and solving problems (rotating shifts of children, perhaps?, until an engineer offered a better solution?). I realize, of course, that Snowpiercer is a fairy tale: the absence of a llvestock car is proof enough of that. But it’s a film, that like (incorrectly read?) Zizek, elevates the Real to the position of Final Truth, demanding that we get with the trauma if we want to live at all. Or it reminds us, faintly, that there’s more to life that the Real, but kills nearly everyone off before we see how that life might have been led. This entry was posted in filmchat, General Culture and tagged snowpiercer, Žižek by medievalkarl. Bookmark the permalink.